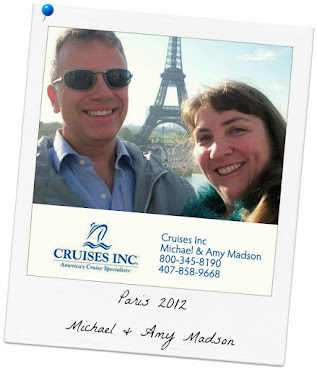 Michael and Amy went on their first cruise on September 22, 1996 on Carnival’s Jubilee. We knew immediately that this was the way to travel. Nice accomodations, unpacking only once, pampering, fun and don’t forget the amazing FOOD! To top it off, we visited three amazing destinations all in 7 days. We booked our first cruise through Cruises Inc and remained loyal clients until we realized that we were doing all the cruise planning for our friends and families - and we ENJOYED IT! After receiving encouragement from our Cruises Inc agent, we decided to join the company and share our love and knowledge of cruising with others. Since 1996, we’ve sailed on over 42 cruises with several different cruise lines. We’ve visited many unique ports and can share first-hand knowledge of ships and shore excursions. We look forward to many, many more. Perhaps one day, with you on-board! We both have many years of customer service experience working in high traffic, vacation destinations and know what it means to "take care of the client". We are happy to spend as much time as needed with new crusiers and love to chat with our many repeat customers just for fun. If you are looking to plan your first cruise, or if you’re ready for your next cruise, please let us share our knowledge in finding the perfect cruise vacation for you.